Bertha Other Bull works for the Northern Cheyenne Head Start Program in Lame Deer, Montana, and serves on the MIEA board of directors. 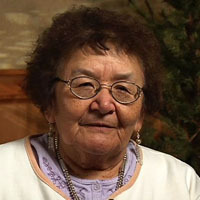 In her interview, Ms. Other Bull shares her insight on traditional Northern Cheyenne values and how an understanding of these values is important to the success of education on or near the reservation. Unique Elements of Northern Cheyenne Culture - Bertha Other Bull. Northern Cheyenne Districts - Bertha Other Bull. Success for Indian Education for All - Bertha Other Bull.